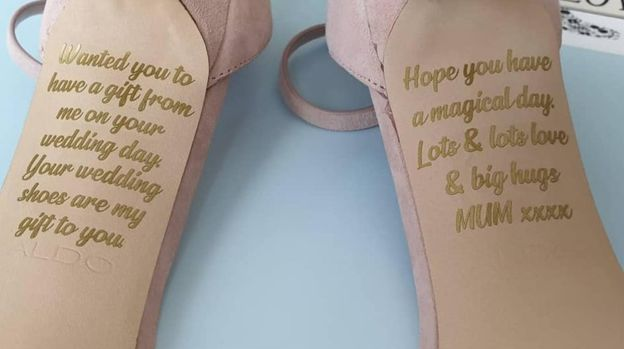 A young British woman who went to collect her wedding shoes found a great surprise waiting for her. When she went to collect her shoes she found a message written on the soles by her mother. In December 2016, Emma Letts, from Leicestershire became engaged to Richard Wilson. A few months later she learned that her mother had been diagnosed with cancer and did not have long to live. Her mother died in 2017, and therefore did not live long enough to see her daughter get married. However, her mother still managed to come to an agreement with the wedding shoe designer to write a message on the shoes. Two weeks ago, Emma went to pick up her shoes since she is getting married in August. When she looked at them she saw the surprise left by her mother. The message read that she wanted to give her a wedding present and that the shoes were her gift. She wrote that she hoped that the day of her wedding would be a magical one. Emma said that when she saw the message she burst out crying and was speechless.